Ok, I will post the English version here, just give me a bit of time. @Henrik, yes, that is the one I am going wit. But I will also do a 2 Axle Hood Unit as well. Just for the fun of it. I also cut some ties and weathered them. This time I hope to have more luck with the hand laying of track. Until I get to the "REPORT" have a look at the new pictures! 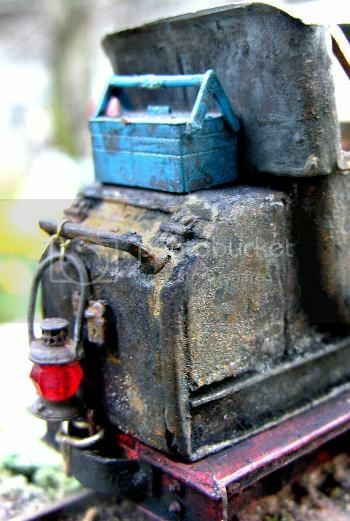 An interesting set of photos of some superbly weathered models. But had a chance to do a little bit. The car with the break platform got a tail lite. I found parts for it in the scrap box, they came from an old POLA kit. OK, have fun and stay tuned, sooooonnn the there will be progress! Last edited by Nevadablue on Sat Mar 19, 2016 3:57 pm, edited 1 time in total. I like that little light Chris. I need to snoop in my parts bins one day and conjure up a few of those. Actually, I should dig out my clay and make some more. This one is all clay except the handle. The cruel closeup makes it look worse than it really is. The lights for the combine in the background were all made from clay. Ignore the alien in the driver's seat, he sneaked into the picture. Nice job on the lanterns! What clay did you use? Thanks Chris. I used Sculpey. It is pretty neat stuff actually. I made a bell and the headlights for the combine from that stuff too. These Sculpey lamps look quite out of shape. Good enough to ruin otherwise convincing models. For lamps and many other parts I can recommend the white metal castings from the US maker OZARK. This is the tail light from my Fiat Zero Gn15 Rail Speeder, discribed elsewhere in this forum.